I promise you that this is the most amazing cake you'll ever make. Even if you only make it one time, promise me you'll make it. It's such a change from the typical white and chocolate cake recipes you usually make. Don't be put off by the fact that it's called Persian Love Cake. What it contains are the very best of Persian flavors. The cake itself has a hint of cardamom and lemon. The light icing contains saffron and rosewater. Sprinkled across the top are rose petals and pistachios. It's a magical combination. Everyone in my family, and my friends absolutely loved it. This cake is a combination of sweet and spicy, floral and citrus. 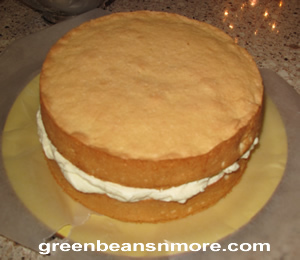 This is an easy homemade cake recipe. The cake itself is a meringue cake, very light. It would make a fabulous birthday cake, or cake for a special romantic evening. My mother-in-law said I could go into the wedding cake business with it, now that's a compliment! I found this recipe on Epicurious. It's attributed to Bon Appetit Magazine. I have added some hopefully helpful comments. You will need to prepare these the night before you make the cake. Make sure that you buy organically grown roses. The cake does not need these as there is rosewater in the icing, nor does it need the addition of pistachios, but it makes it much more special. * 1/4 teaspoon whole cardamom seeds (removed from about 5 green cardamom pods). Grind the seeds or use a mortar and pestle. I'd definitely suggest you use the seeds from the pods. They're much more pungent than jarred ground cardamom. Sift flour, 7 tablespoons baker's sugar, baking powder, and salt into large bowl. Whisk yolks, water, canola oil and grated lemon peel and cardamom in small bowl until smooth. Add yolk mixture to dry ingredients; whisk until smooth. Beat egg whites in medium bowl until soft peaks form. 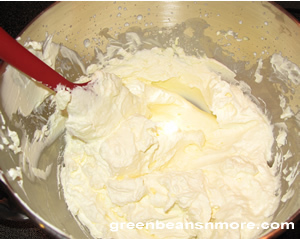 Gradually add 7 tablespoons baker's sugar; beat until whites resemble thick marshmallow fluff. Fold whites into batter in 3 additions. Divide batter between prepared pans. Bake until cakes are golden and tester inserted into center comes out clean, about 25 minutes. This icing recipe makes a lot so you can be generous with it. * Pinch of saffron threads - I have read online some people say they made the icing without the saffron. It's a very important flavor component. If you don't have saffron, don't make it. Beat remaining 2 cups cream, powdered sugar, and rose water in large bowl until soft peaks form; strain in saffron cream. Straining the saffron removes any lumps that occurred while simmering the cream and the saffron threads. I recommend you strain it but you don't have to. Either way the flavor/outcome is the same. 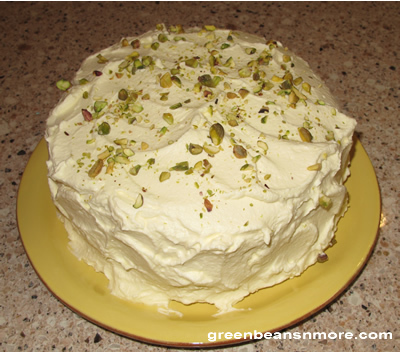 Decorate the iced cake with rose petals and pistachios. Natural unsalted pistachios can be difficult to find. Whatever you do DO NOT USE roasted salted pistachios. You may find natural unsalted pistachios in stores like Whole Foods or a local ethnic market. If you are lucky you may be able to find Persian Slivered Pistachios. They can be ordered online. Let the cake chill for one hour. It's best eaten same day, or next day to retain it's best flavor and freshness.